Satomi Kataoka, who also authored Bushido, koko ni yomigaeri (Rebirth here of samurai code) in 2001, presents in Ai shite yamazu (Unending love) her personal experiences and her profound admiration for bushido and the great men who followed the way of the samurai even to death. Although she mentions a few historical facts, her intensively subjective approach to the topic focuses on her emotions and even becomes somewhat mystical at times. 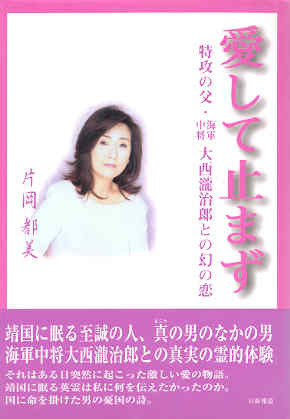 The subtitle of Fantasy Love with Vice Admiral Takijiro Onishi, Father of Special Attacks, describes the book's primary topic, but she also frequently mentions details about her life. Chapter 2, the most autobiographical of the book's three chapters, covers hardships Kataoka had to overcome. Her parents send her to Los Angeles at age 15 with a meager monthly allowance, so in order to survive she makes money at various jobs such as pool cleaning, car washing, newspaper delivery, and working at McDonald's (where she also almost always eats). While in the US she reads Japanese ultranationalist Yukio Mishima's book entitled Yukoku (Patriotism), which fills her with admiration for bushido's tenets of loyalty and self-sacrifice. She becomes homesick while reading the book and decides to return to Japan at age 21. In 1990 at age 25, she becomes President of Princess Garden Hotel in Tokyo after meeting one of her uncle's business associates. Alberto Fujimori served as Peru's President from 1990 to 2000, and he stayed at the Princess Garden Hotel when he returned to Japan after his exile from Peru. In April 2006, Kataoka married Fujimori, who is about 30 years older. After a long and controversial trial in which Fujimori was charged in Peru with human rights violations and corruption, he received in 2009 a 25-year jail sentence. Kataoka displays in Ai shite yamazu (Unending love) a fascination and love for powerful older men such as Vice Admiral Onishi, 54 years old at his death, so her marriage to the much older Fujimori may not have been such a surprise. As an aside, a small desert town in Peru renamed itself Satomi Kataoka in honor of the former President's wife. Chapter 1 describes Kataoka's first visit to Yushukan Museum at Yasukuni Shrine as a key event that transformed her way of thinking and living. When she goes to a special exhibition of last letters written by kamikaze pilots and others who died during WWII, she is amazed and impressed as she reads them. She bursts out crying as she considers the beautiful and noble words written by kamikaze pilots who she considers to have bravely given their lives for their country and families. At Yushukan Museum she also encounters Admiral Isoroku Yamamoto, Commander of the Combined Fleet until his death in April 1943, and Admiral Seiichi Ito, who commanded battleship Yamato on her suicide mission toward Okinawa on April 7, 1945. At the end of the museum tour, she becomes enthralled with the exhibit on Takijiro Onishi. A museum placard gives the story of Vice Admiral Takijiro Onishi that fascinated Kataoka so much. In October 1944, Vice Admiral Onishi as Commander of the First Air Fleet had only about 100 aircraft left including 30 fighters when he arrived at command headquarters in Manila. In this desperate situation, Onishi believed the only chance of success would be to carry out taiatari (body-crashing) suicide attacks against enemy ships. Onishi, appointed Vice Chief of the Naval General Staff late in the war, committed harakiri or seppuku (ritual suicide by cutting open his belly) on August 16, 1945, the day after the announcement of the end of the war by the Emperor. He suffered more than 15 hours before dying, and he refused any medical attention. Onishi's last letter at Yushukan Museum expresses his appreciation for his men's skilled fighting, his apologies to their spirits and bereaved families, and his desire that in peace the Japanese people will keep up the tokko (special attack) spirit and will do their best for Japan's welfare and for peace among the world's peoples. Onishi used to tell departing kamikaze pilots, "I too surely will go after you." In the same way, Kataoka voices her commitment, "Your Excellency, Mr. Onishi, I also someday will surely go, following your path." Soon after her first Yushukan Museum visit, as described in the book's Introduction, Kataoka returns to view the blood-stained sheets, gown, and uniform from Onishi's suicide, which had been stored in two trunks that had not been opened for more than 50 years. She takes the blood-stained items with both hands, rubs them to her cheek, and holds them to her breast. Mr. Onishi, it is Miyako. On the 53rd day after meeting you for the first time at Yushukan Museum, I have been able to come like this before your grave. I had lived in whatever way I wanted according to my youth and selfishness, but I changed when I came in contact with the supremely courageous and patriotic deeds of Your Excellency and the Special Attack Corps members. If you look, despite all of these noble sacrifices, Japan has lost both its pride and self-confidence. We are despised by other countries and continue on the road of ruin for our country. In order to once again make a recovery, somehow we must learn from your actions in which you all gave your lives, and we must make a firm decision to continue after you. The long period of postwar humiliation and debate has ended. Your Excellency, you said, "the purity of youth will usher in the Divine Wind." If you need new offerings of human lives for the country's defense, I will go running straight ahead in my youth. Your Excellency, I will go. Following your path, wherever. When Kataoka goes to visit Onishi's grave, she discovers that there is open space to the right side of his grave. She asks the Buddhist priest who accompanied her, "If I were placed beside the Vice Admiral's grave, do you think his wife would allow me to be there?" The priest responds, "His wife Yoshie was a very tolerant person. There is no problem." She leaves thinking, "Please wait for me, Your Excellency. Someday surely you'll keep with me the vow from the land of the dead." Kataoka ends this emotional ultranationalistic book by expressing her unending love for Onishi and her commitment to give her life on behalf of Japan.